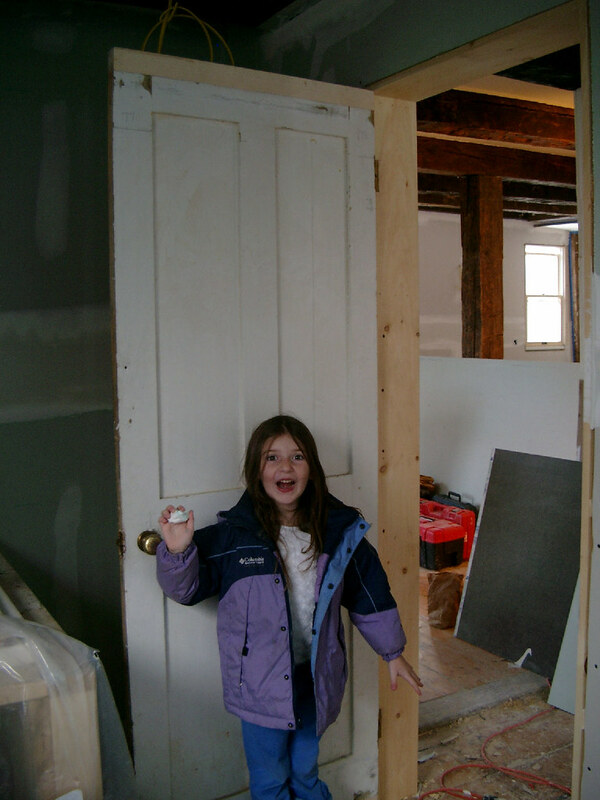 Yesterday, many of the interior doors went up, including the ones in the bathrooms and closets. 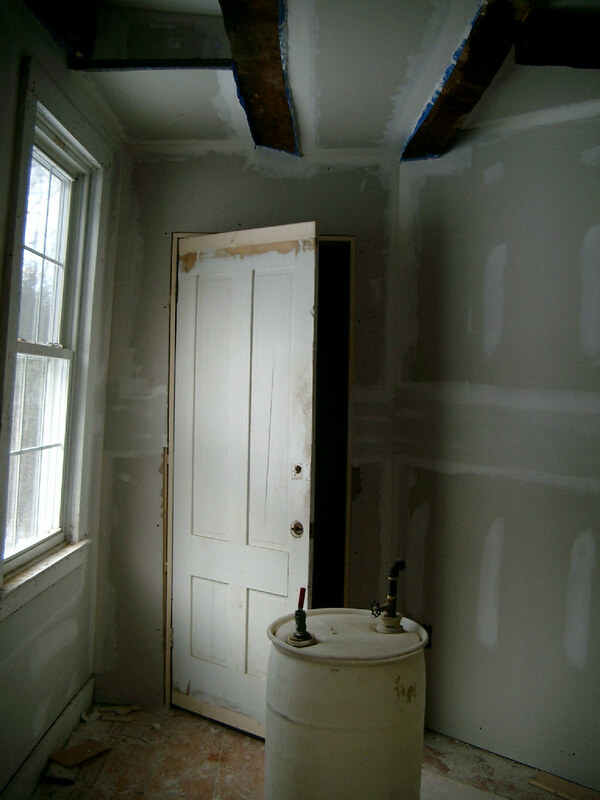 Where possible, we’re reusing existing doors (from the old pantry, bathroom, closets, etc. ), so, at the end of this, we’ll have a bunch of old doors that need hardware and a lick of paint, but at least we’ll have some privacy. 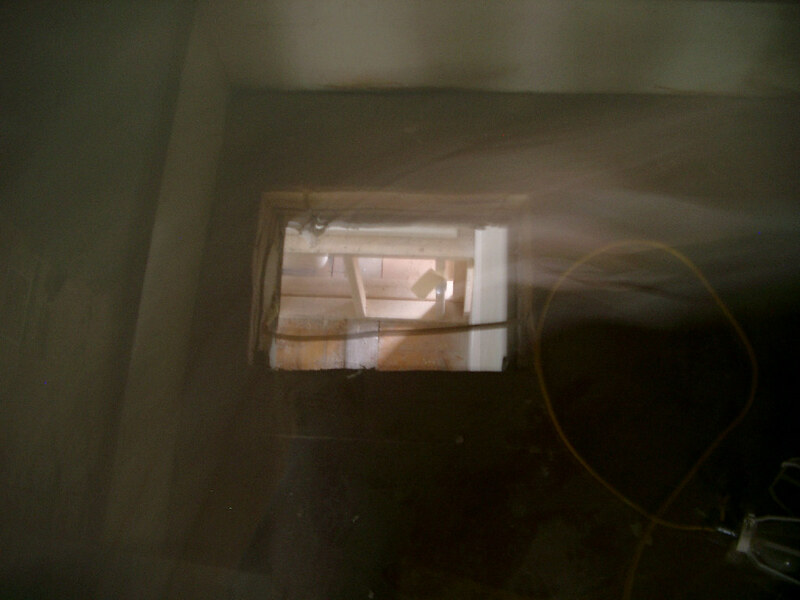 Note the clearance between the door and the frame for the soaking tub in the left corner of the picture. Just enough. It looks better to me now that the sheetrock is up and the door is in, but, then again, the front wall of the house looks scarily off-kilter now. Speaking of entrances and exits, they’ve finally cut the holes for the laundry chute! 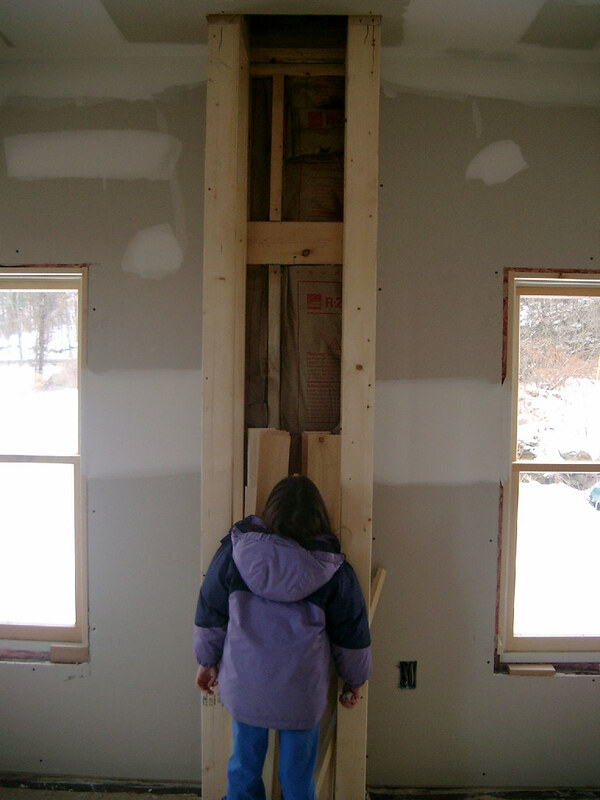 The chute will go from the closet next to the upstairs bathroom, down through the downstairs bathroom, and into the basement. The chute will be made of a round, plastic tube, surrounded by a wooden “chase” (which I imagine will look like a wooden box around the whole thing, with an opening on each floor through which we can shove dirty laundry). One big result of moving the house is that the front door is no longer one step away from the ground. We didn’t leave much in the budget to deal with this situation, partially because no one really knew how much of an issue it would be after the final grading was done. Now we know. It’s going to take probably around four steps to get us from the first floor down to the ground. 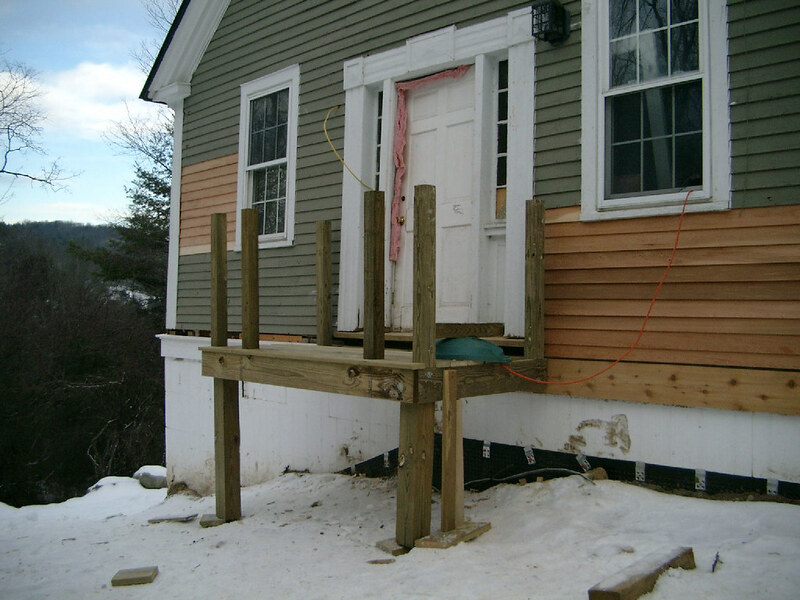 For now, McKernon is building us a simple landing and set of stairs that will match the look of the deck/porch on the back. It’s one of the things we plan to work on more when we get to “phase 2” of the project. Hyla thinks we should have a slide instead. Will the chase around the stovepipe allow access to the pipe? Metalbestos? 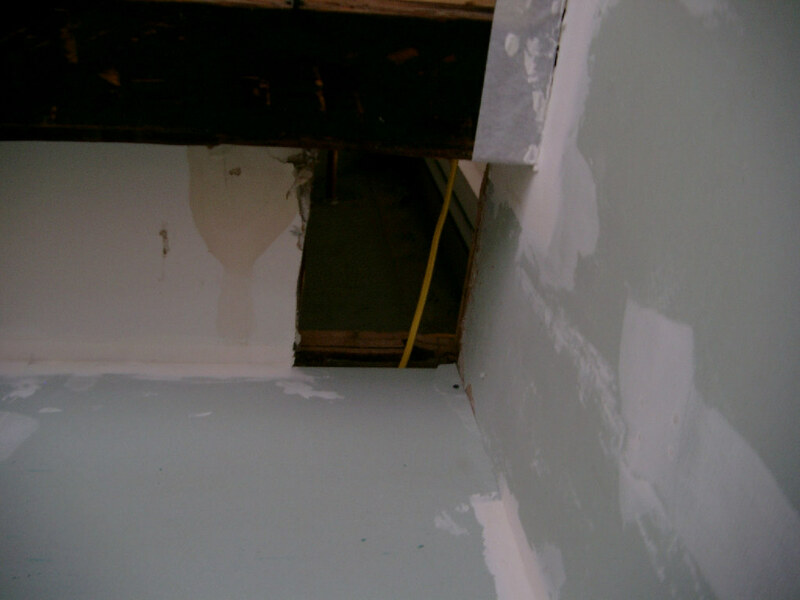 I had a similiar chase in a 150 year old Cape up in Albany VT and some difficulties when I needed to replace pipe.